Anne was the elder sister of Henry Hyde, eventual 2nd Earl of Clarendon and was born at Cranbourne Lodge in Windsor Great Park. Both were children of Edward Hyde, 1st Earl of Clarendon, and his second wife, Frances, daughter of Sir Thomas Aylesbury, Keeper of Cranbourne Chase. During the period of her father's exile, Anne lived in Breda, as maid of honour to the Princess of Orange, where she seems to have been distinguished for her sprightly gaiety. It was on a visit to Paris, in 1656, in the Princess's train that she first met the Prince James, the Duke of York, who was immediately attracted by her. Three years later, he engaged to marry her and deserves some credit for carrying out his promise, in spite of the alteration in his position which the Restoration in England had produced. The marriage was secretly celebrated on 3rd September 1660, at midnight, and was not made public till two months later. Anne's father, who had been wisely kept in ignorance, was unpaternally distressed by the news. In his first fears for his own popularity, he even went so far as to advise that his daughter should be immediately sent to the Tower. King Charles II, however, took a more philosophical view of his brother's marriage, being perhaps reconciled by Anne's wit and undeniable cleverness. In political affairs, she managed her husband to a great extent, besides directing his patronage of art and letters. It was even said that she attended his Council in order to control his expenditure. In fact it was Pepys' opinion that "the Duke, in all things but his amours, was led by the nose by his wife," but this limitation of her influence rendered the marriage unhappy. Anne naturally resented James' numerous and vulgar intrigues, but received little sympathy at Court. Her pride and grandness of manner made her many enemies among those who envied her exalted position. Marvell and others levelled the most revolting accusations against her with impunity. 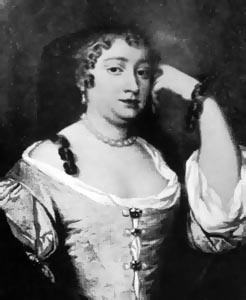 She was charged with murdering one of her husband's mistresses and was supposed to have formed a liaison with Henry Sidney, whom James had got banished from Court. In 1670, Anne became a secret convert to Catholicism, perhaps with a view to recovering her influence over her husband. However, having fallen ill beneath a famous oak tree at White Waltham in Windsor Forest, she died of cancer in the following year. Of her eight children, Mary and Anne alone survived her. Though not beautiful, Anne undoubtedly possessed considerable attractions and much natural cleverness. She may not have been a shining example of rigid virtue, and she was reputed to be gluttonous; but it is unlikely that Clarendon's daughter and Mary's mother was really bad. In any case, we may be sure that she was a great deal too good for such a husband as the man who was later to become King James II of England & VII of Scots. Edited from CRL Fletcher's 'Historical Portraits' (1911).